Is Skechers a Good Value? In the world of footwear, Skechers is the underdog in a David and Goliath situation. Should investors put their money on David? In the last few years, "athleisure" has been a popular trend in clothing. Nike (NYSE:NKE) and Under Armour (NYSE:UAA) stock have gotten a nice boost as people opt to make their gym clothes a part of their wardrobe outside of the gym. 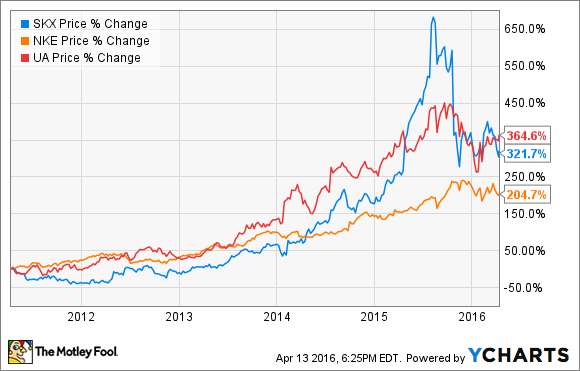 What about Skechers (NYSE:SKX) stock? How has it fared recently, and are investors missing out on an overlooked opportunity? What exactly is "athleisure"? Perhaps you immediately think back to your stylish 80's track suits. It seems that in fashion, we always come full circle. Although the current trend largely steers clear of the baggy neon, companies that offer athletic apparel like yoga pants (think Lululemon (NASDAQ:LULU), close fitting workout tops, and workout shoes have had a field day. Here is a chart showing stock performance over the last few years. While Skechers limits its offerings to footwear only, it too has performed well. It and Under Armour have both given investors a more than 300% return since 2011. Even with the impressive run, the upstart footwear company is still only a fraction of the size of its larger rivals, sporting a valuation of about $4.4 billion to Under Armour's $19 billion and Nike's $100 billion. Skechers' performance over the last year is roughly in line with the big names in the sports apparel industry. Both operating and net margin, as well as return on equity sits in between Under Armour and Nike. Return on equity, especially, demonstrates management's ability to generate returns on investor money. At over 20%, Skechers management team has done a good job of this in the last year. Moving on to valuation, the company has low levels of debt, a low share price to revenue reflected in price to sales, and a low trailing price to earnings ratio relative to peers. Part of the reason for this is that the stock got clobbered the second half of 2015, as we can see in the graph shown earlier. Despite solid growth, the company still missed numbers that analysts wanted to see in the third quarter of last year, and shares subsequently sold off. If the upstart shoe company can keep the same kind of performance going, shares are a better deal than their larger competitors. Demand for sports apparel in general is expected to stay en vogue. Whether you are an "athleisure" enthusiast or not, Wall Street thinks that earnings growth of 20% each year in the next five for Skechers is in order. 25% and 14% is the anticipated growth for Under Armour and Nike, respectively, while the rest of the sports apparel industry is expected to grow at an average of 14% per year during the same time. While those are respectable numbers, a lot of that growth is already baked into share prices as indicated by the high price to sales and price to earnings for Under Armour and Nike. Factoring for the high growth and a lower valuation, I think investors should give Skechers stock a look.